This post is by your editor, Kathie Hodge. She’s a fan of old books, even when they’re moldy. Mold appears out of nowhere, doesn’t it? Baseball mitts left in the garage develop disturbing colors; perfect raspberries get furry in a wink. It wasn’t til 1729 that Micheli showed that fungi make spores that act like tiny seeds, which Bassi later found could cause disease in animals. Still later, Pasteur applied these ideas to humans, and thanks to him I did not die of rabies. But anyway, back in 1583 this chap here, Andrea Cesalpino, thought molds were more like crystals that sprang direct from the thing they grew on. So it struck me as funny when we found fungi growing on his own book. 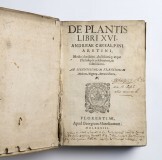 That’s right, last year Cornell’s Library acquired an original 1583 copy of Cesalpino’s classic, De Plantis. It’s a seminal work, being an early influence on how we classify life today, and marking the revival of plant studies after the middle ages.3 Although remarkably clean for a 430 year-old book, it had some speckles and splotches. We looked at them under the microscope, and here is what we found. We found long twisting fibers of linen. Linen fibers refract the polarized light of my microscope into glorious rainbows, and the fibers are checked with little crossways lines. They are mostly made of cellulose, a strong and durable building material made by all plants. Among the linen fibers, we found angular black chunks of soot. Perhaps it is soot from the lamp of an ancient scholar who fell asleep while making the notes we found in the margins. The soot is not harming the book, just besmirching it. We found mold. 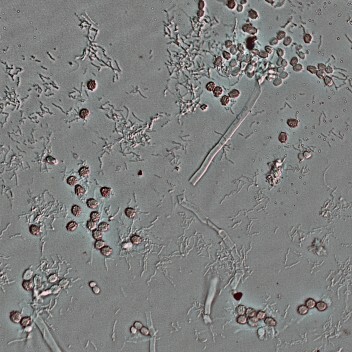 A Penicillium or an Aspergillus. We didn’t find much of it— most of the speckles and “dirt” in the book were soot. The few speckles of mold were small and who-knows-how old. We found two Alternaria spores. 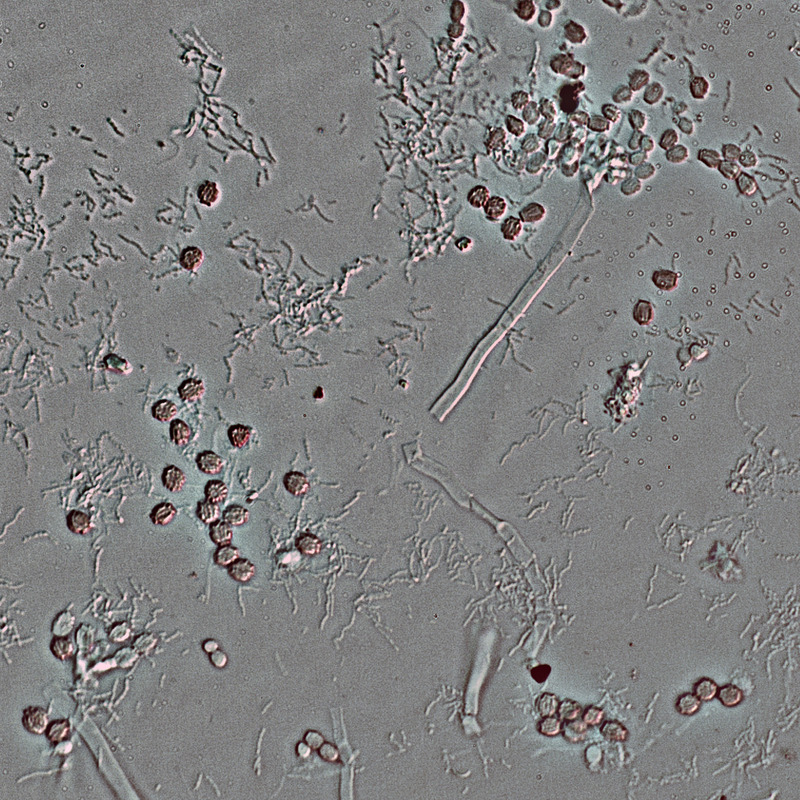 We found actinobacteria: they look like scaled-down fungi, but are a filamentous kind of bacteria. They are so small Cesalpino coudn’t have seen them and never imagined their existence. These molds and bacteria were not happy, because their book is not wet, and is unlikely to get wet again. Back in happier times, they found themselves on a damp spot, and set about eating the book. It is tempting to think of molds as a surface phenomenon, but molds grow in and along the cellulose fibers of the paper, digesting them. That’s why brushing molds off the surface of an old book doesn’t solve the problem. Drying can stop them, because nothing can grow without moisture. Some plants have no seed; these are the most imperfect, and spring from decaying substances; and they therefore have to feed themselves and grow, and are unable to produce their like; they are a sort of intermediate existence between plants and inanimate nature. There is nothing inanimate about molds, which have no problem spreading their spores around. When those spores land in the right place, they waste no time growing and making more spores. So wet books get moldy, it is a sad fact. Books are made mainly of cellulose, which is not unlike a delicious necklace of candy pearls. People can’t digest cellulose, because we can’t break the links of the necklace to release the pearls of sugar, but very many fungi can. 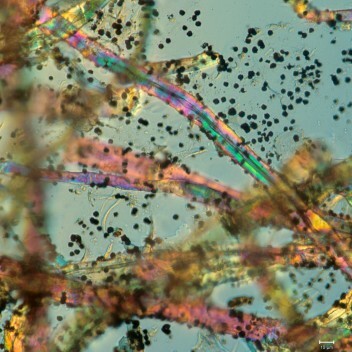 In fact fungi are the most important cellulose degrading organisms on earth. Ancient paper-making techniques also incorporated animal-based glues. Modern paper might also contain resin, alum, and chalk.1 All but the alum and chalk can nourish the right fungus or bacterium. Cornell Library’s Conservation department knows what to do with a moldy old book. Visit their blog to read about the initial diagnosis and Mary Schoenfelder’s loving conservation of this very book. John Ramsbottom. 1953. Mushrooms and Toadstools. Bloomsberry Books. Bremekamp. 1953. A Re-examination of Cesalpino’s Classification. Acta Bot. Neerl. 1:580–593. 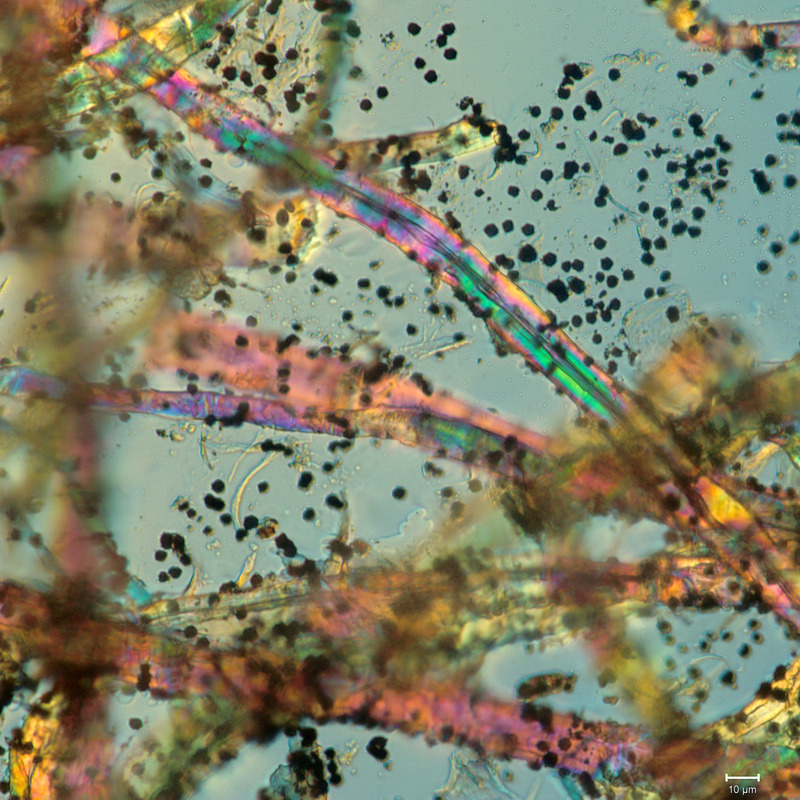 Microscope images of soot and microbes by me, Kathie Hodge; photo of the book by Kent Loeffler, who recently retired— ack! My thanks to Michele Brown for sharing the privelege of working with such an old and wonderful book. Fantastic post! My favorite kind, weaving mycology with history, etc. At least Cesalpino wasn’t completely off, since fungi aren’t plants. He must have sensed somehow they they are a bit different. Cesalpina evidently was an avid observer and presented lucid descriptive interpretations of plant arts, their modifications, and functions. However it is, in my opinion, the systematics for which he is now primarily remembered. Nevertheless I fully agree about this article being a wonderful blend of mycology and history. I enjoyed it!